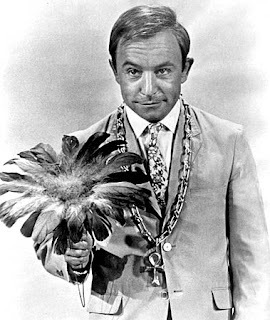 Henry Gibson (nee James Bateman in Germantown, Pennsylvania, in 1935) died on September 14 of cancer. An actor most recently known for the recurring role of Judge Clark Brown on Boston Legal, Gibson was a veteran of Hollowood and television, though the Poetry & Popular Culture office remembers him most for his role as "The Poet" on Rowan & Martin's Laugh-In—the most famous mass-produced poet since Ernie Kovacs' Percy Dovetonsils. Each week, emphasizing the "Ibsen" in his last name and wearing an ankh on a chain around his neck, Gibson held a giant flower—an image that no doubt recalled the flower that Percy Dovetonsils used to stir his drink a decade earlier—and recited a short, humorous poem. Audiences were so taken with his verse that they eventually led to the publication of A Flower Child's Garden of Verses (New American Library, 1970) and two comedy albums, The Alligator and The Grass Menagerie. The alligator is my pal. He could be your pal, too. That he's got feelings too. He likes to wink and flirt. Than wear him on my shirt. That he needs protein too. He loves to play and swim about. He never sings the blues. Than wearing him as shoes. For a nice collection of Gibson's Laugh-In verse (plus guest appearances by John Wayne and a hilarious Sammy Davis, Jr.) check out the video here. For a startling contrast, click here for an example of Percy Dovetonsils. What do you make of the similarities and differences?